It’s being called an exoskeleton for the paralyzed — a device consisting of leg braces, motion sensors, motorized joints, a computer and a remote control that helps people who are paralyzed from the waist down to sit, stand and walk with assistance. And it’s the first such motorized device to get the U.S. Food and Drug Administration‘s stamp of approval for home use. It’s already in use in rehabilitation facilities. ReWalk was built for people who are disabled by some spinal cord injuries. It was developed by the founder of Israel-based Argo Medical Technologies, who was paralyzed in a vehicle crash. The device uses braces with motion sensors that strap around the legs. Motorized joints supply movement to the hips, knees and ankles. A backpack holds a computer and power supply, and crutches offer stability. The user wears a wireless remote control on the wrist through which he can command ReWalk to stand up, sit down or walk — with a little help. According to the U.S. Centers for Disease Control and Prevention, there are about 200,000 people in the United States living with a spinal cord injury. From BBC News Ouch! 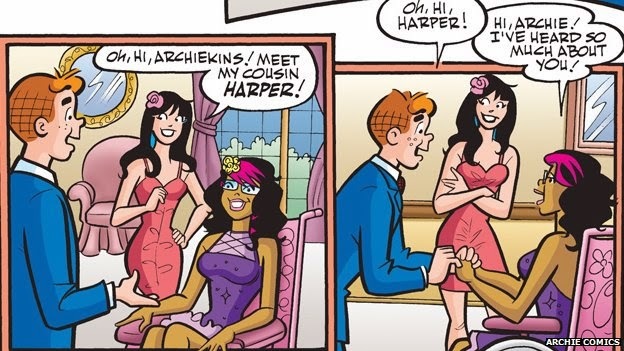 Pictured is Archie Comics' Harper Lodge, a new disabled character. She uses a wheelchair following a car accident when she was a young girl. As long-running American comic Archie announces the introduction of a new disabled character, we look at how disability is portrayed in comics. A broad range of disabilities have been represented in comics over the years. From the 'Golden Age' of the 40s and 50s, they have included superheroes like Doctor Mid-Nite who is blind, and Freddy Freeman, the alter ego of Captain Marvel Jr., who uses a crutch when not in hero guise, as well as characters such as Misty Knight who is an amputee and Echo who is deaf. Doctor Mid-Nite, developed by DC Comics, is widely considered the first disabled superhero character, appearing for the first time in 1941. His vision is "inverted" after an owl - which he later adopts as his sidekick - crashes through the window. This means he can see in the dark but is blind in the daytime unless he uses infrared glasses. Marvel Comics' Daredevil, also a 2003 Hollywood film starring Ben Affleck, was blinded by a radioactive substance. While he can no longer see, his other senses are superhumanly heightened meaning he can "see" more than sighted people. Though these superhero characters are disabled, some feel they can't really be categorised as positive portrayals because they are so fantastical. "Characters like Daredevil have superpowers that compensate for their disability," says graphic novelist Al Davison from Newcastle. "This is not realistic or fair." "We need more comic book characters who are believable representations of disabled people, rather than ones whose disabilities are negated by superpowers." Davison has spina bifida and uses a wheelchair himself. His own graphic novel The Spiral Cage is an autobiographical work which he hopes will bring a bit of reality to comic book representation of disability. The comic characters Rogue, Wolverine and Mystique from the X-men, who have a renewed popularity thanks to the movie franchise, have anxieties brought on by their differences, for example a feeling of isolation. "X-men is a story about alienation and marginalisation," says Dr David Huxley, a lecturer at Manchester University who specialises in comics and graphic novels. "It directly responds to the way in which disabled people can be made to feel." The moral compass for the X-men is the wheelchair-using Professor X. "The fact that he's in a chair is irrelevant to the plot," Huxley says adding that he believes this is an entirely positive thing. "Brain power is the most important aspect of his character, and this is a key message." The Archie comic strip is not fantasy. It tells everyday stories and has been running since 1939. It has become known for its diverse characters but it has only recently brought in a disabled character after a long absence of disability from its pages. This is all down to one person who was annoyed that people like her were not represented. At a 2013 Fan Expo in Toronto, long-time reader Jewel Kats knew that Archie artist and writer Dan Parent was there and tracked him down. "I had a bone to pick with him - so I did," she says. 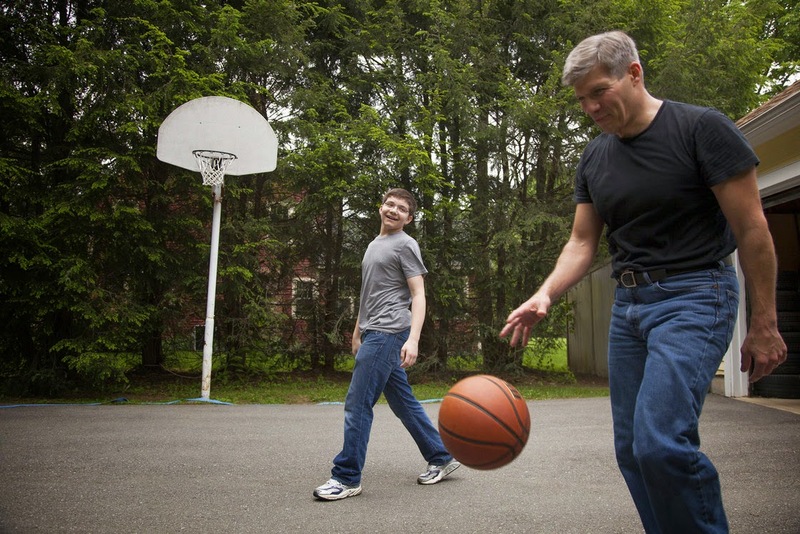 "I wheeled right up to him, I looked him square in the eye, and I said to him, "why isn't there a character with a disability in the town that Archie lives in? How is that possible?" Kats was there promoting a reality web comic strip she produces based on her own life called DitzAbled Princess. Parent used her as inspiration for a new disabled character who was given the name Harper and has sought her advice on development. Harper Lodge is a fashion designer; she's of mixed race and uses a wheelchair following a car accident when she was a young girl. Kats and Parent were keen that she isn't just a "disability character" but that she is, as Parent says: "part of the gang" that just happens to be disabled." For Kats she is an important addition. "I've always wanted figures growing up that I could relate to, and now Harper exists. She's here for every kid with a disability and is a role model," she says. Back in the mainstream, when Batgirl (or Barbara Gordon) was shot by The Joker in 1988 and became paralysed, a superhero was re-born. She became Oracle, a wheelchair-using computer genius who exploited her technical expertise and was soon embraced by comic book fans like B.A. Boyd who uses a wheelchair due to her spina bifida. "When I found out that Oracle also uses a wheelchair I was so happy, she says. "I finally felt included and broke away from the shell I had encased myself in." In 2011 however, a DC Comics re-launch led to an editorial refresh. After two decades of being disabled, a cure was found for Oracle's paralysis but the move was not popular with all fans. "I was broken-hearted when I discovered that we were losing Oracle," says Boyd. "It is something that still pains me, to this day." Writer Gail Simone, who developed Oracle while the character was recovering from her disability, was to be the writer on the new title which took her back to being Batgirl. She opened up a conversation with disabled and non-disabled fans to find out what their views were and how to take the character forward. "She now provides representation of disabled individuals who are able to find and come to recovery," says Boyd. "She still carries it with her, and is forever changed by what happened to her, which is valuable, and, to me, very appreciated." Disabled characters are in many comics out there but - since Oracle at least - haven't successfully broken through into the mainstream. The Movement, a DC Comics series, focusing on a group of diverse teenagers, features the character of Vengeance Moth, a 19-year-old woman who uses a wheelchair, because she has muscular dystrophy. It was written by Simone who again sought advice from disabled fans, including Boyd and Davison, to make sure the wheelchair was not just a surface detail. The series proved unpopular though and was cancelled in February. "I'm in a wheelchair and a fifth degree black belt in Kung Fu," says Davison. He believes that his skills prove that disabled people can be great comic book characters in their own right and that they don't need super powers which effectively neutralise their disability. "Mainstream comics need many more disabled people full-stop. They have the ability to reflect real-life in all its diversity and quite often are failing to do so for financial reasons." TORONTO -- Izzy Camilleri has seen her signature creations featured on runways and on the big screen, but a new exhibit is offering a unique platform for the Canadian designer by showcasing her innovative fashions for people using wheelchairs. "Fashion Follows Form: Designs for Sitting" opens Saturday at the Royal Ontario Museum in Toronto. Camilleri's creations are a focal point in the exhibit, which features items from her IZ Adaptive clothing line for both men and women. "It's huge. It's an honour," Camilleri said in an interview during a preview of the exhibit. "It's really great to be able to share my story and my history, and put (out) the work I'm doing now, which is very important for people to know about that need it." Journalist Barbara Turnbull is an honorary co-chair of the exhibit and has a special connection to Camilleri as the designer's first seated client. She became quadriplegic in her teens after being shot during a convenience store robbery. In need of a shearling cape to keep her warm during the winter, the Toronto Star reporter was referred to Camilleri by the newspaper's fashion editor at the time, Bernadette Morra. "It was from that point on that I started to learn about some of the challenges that people have in a wheelchair combined with a disability," Camilleri recalled. "It was very eye-opening because I never realized that people had any issues with getting dressed when they're in their chairs. So that was the seed that was planted." She launched IZ Adaptive in 2009. Initially, learning to create clothing for seated clients presented a fresh set of challenges and considerations for Camilleri. "When you're paralyzed, for example, the risk of pressure sores is huge. And sometimes you can get pressure sores from your clothes," she said. "I needed to learn how the clothes needed to be cut and even about seams and bulk and stuff like that. You could actually hurt someone if you don't do it properly. "It took years and years and years of listening and learning and understanding how I can create the patterns so they work and they don't hurt." To help further illuminate how the items are customized for individuals in wheelchairs, a selection of the Toronto-based designer's works are displayed in both seated and standing positions. A classic trench coat is drafted in an L-shape following the line of the body while seated, while a formal suit features added length to the back and less in the front body area to accommodate the wearer. Detailed descriptions accompany each item showcased, highlighting the meticulous work done to make them easier to wear, put on and take off. A prime example is a sleek leather jacket that separates into two pieces, lined with organic cotton knit for warmth and bearing zippers from the cuffs to elbow that are easier to open and close. 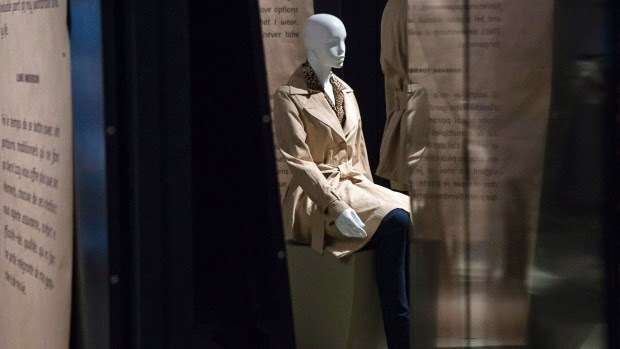 The exhibit also features some of Camilleri's other notable designs, including the silver fox coat worn by Meryl Streep in the fashionable flick "The Devil Wears Prada." Alexandra Palmer, senior curator in textiles and costume at the ROM, said she never set out to showcase Camilleri's work. However, after leaving her yoga class one day, she recalled stumbling into Camilleri's shop where the designer explained the adaptive clothing concept. "I was very struck with this idea, which was a fashion need that I never really thought about and has been ignored and not really addressed by the fashion industry," Palmer said. "As well, looking at her clothes and her cuts reminded me of historical shapes." To that end, the ROM has also drawn on its own collection of 18th and 19th-century fashions created for the seated, L-shaped body to showcase alongside Camilleri's contemporary creations. An embellished evening cape cut to accommodate the bustle, and a tailored habit for riding are among the items taken from the archives. Camilleri said she has IZ Adapative clients in the U.S., U.K. and Australia and has received feedback from clients expressing gratitude for its presence. "Sometimes, it can be transforming for people because they've never been able to dress properly or they buy things that are too big because it's easier to get on -- but then they look all dishevelled," she said. "It's allowed people to also ... be who they are. It gives them identity, it gives them dignity." "Fashion Follows Form: Designs for Sitting" is on display in the Patricia Harris Gallery of Textiles & Costume at the ROM until Jan. 25, 2015. By Alyssa Rosenberg, pop culture blogger for The Washington Post. You can access the Storify about the event here. In the picture EEOC commissioner, Chai Feldblum, speaks at the forum. 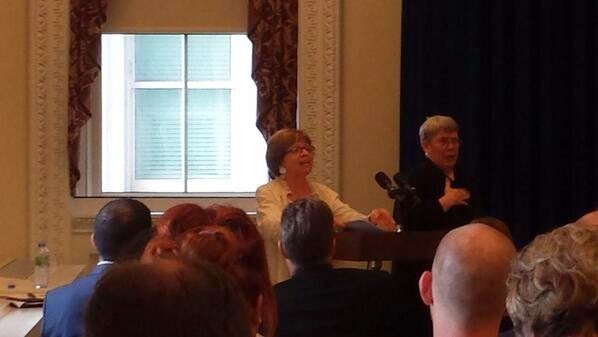 Rebecca Cokley, the executive director of the National Council on Disability, was kind enough to invite me to a forum at the White House on Thursday about the intersection of LGBT (lesbian, gay, bisexual and transgender) and disability issues. The event was technically off the record, but it was vociferously and enthusiastically tweeted about by the participants, and Cokley gave me permission to Storify my own tweets so you all could have some sense of the event. There was a lot of discussion of policy, enforcement of the laws around sexual orientation, gender identity and disability, and the fights for bills like the Americans With Disabilities Act and the Affordable Care Act. But there was also a lot of conversation about culture, and what it teaches us about the world, particularly in two keynote addresses by actress Geri Jewell and comics writer Gail Simone. My tweets focused mostly on those parts of the forum. There was one idea, really an expression of the collective stories the panelists told, that I think has a particular application for the way we talk about culture: that progress does not arrive at the same time for everyone. LGBT folks in the same city can have wildly divergent experiences at home, at school and at work. Folks with disabilities who get into a leadership program may have a radically different education from their peers in the same school system who do not make the cut. And this is not even to get into differences across regions, classes or any other factor that can influence coming out, the quality of education you get, and the jobs and support systems that are available to you. For this reason, it is terribly important to remember that making culture more diverse is not a matter of simply putting members of an underrepresented community on screen. You cannot give audiences the same affluent, white gay men and claim you are representing the gay community. You cannot give audiences only people who began using wheelchairs after car wrecks and decide you have fulfilled your quota of characters with disabilities. The shift away from representing gay men as predators to treating them like people with emotional and professional lives is a significant step, but it is the first one. The realization that people with disabilities have sexuality, too, an important aspect of the early years of “Glee,” is a start, but not an ending. If including characters with disabilities or LGBT characters is just an occasion to develop extremely limited new tropes, that is not just a failure of diversity. It is a failure of a great creative opportunity. TORONTO - No matter where his clients are based, John Cook seeks to help them bypass one of their main shopping obstacles: finding comfortable garments suited to meet their mobility needs. In 2009, Cook teamed with Jennifer Gallienne to form Koolway Sports, a Whitby, Ont.-based company specializing in designing a colourful range of outerwear for people who use wheelchairs. The garments are handsewn, and Cook said 99 per cent of their products are custom-made for the individual, which can also feature personal touches like sewn-on crests of their favourite sports teams. Blanket fronts and backs can be zippered on and off of jackets, while zippers in the sleeves allow for the clients to be dressed while in their wheelchairs, said Gallienne. Meanwhile, a shorter back eliminates excess fabric and prevents considerable bulk from going down the back of the chair, she noted. "There isn't a day (that goes) by when we're going for a fitting or we take delivery or we're talking to a parent on the phone where there isn't a tear in your eye," said Cook, who has been involved with the Special Olympics prior to Koolway Sports. "It's not the price of the coat or the monetary thing. It's the fact that we're able to give this back to the world of individuals who really need this." Gallienne said the company's mandate is to foster a sense of inclusivity, especially for children. "They should be going out to recess, they should be going to their brother's baseball games and hockey tournaments and to be able to sit in and arena and ... to be dry and to look good and feel good." During the recent People in Motion showcase in Toronto — billed as the largest disability exhibition in Canada — Cook and Gallienne met with prospective clients and caregivers alike filing into their booth to inquire about their product range. Malton, Ont., resident Jackie Patel has lived with multiple sclerosis for 17 years and has been using a wheelchair for nearly a decade. The Koolway client still has mobility in her upper body and is able to put on and remove the company's spring cape with ease. However, she finds meeting her other clothing needs can prove trying. "All my clothes now are a little bit bigger and roomier than I would initially have worn my clothes," said Patel, who needs the extra room in the fabric to be able to put on and remove items more easily. The 49-year-old said she also wears oversized shoes to accommodate her bloated feet, as well as leggings underneath her skirts and dresses to keep her legs warm. "I would like to see more clothing for the disabled that John and Jennifer have. Maybe not coats, but pants with zippers on the inside ... from one end to the other from the inside. I don't wear pants anymore because (they're) too hard to get on and off." Tony Dolan, national chairperson for the Council of Canadians with Disabilities, uses a wheelchair and said he spends hundreds of dollars a year modifying clothing. 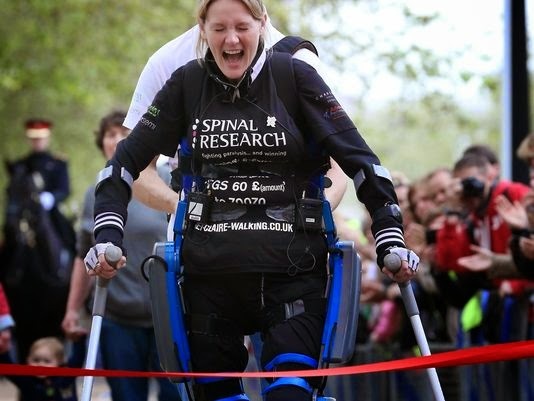 "A regular suit jacket is difficult to wear in a wheelchair, especially if you're pushing it, because the side suit jacket falls down on the wheels and gets all muddy and dirty and it is quite difficult to manoeuvre in a suit. So you need a jacket that's a bit longer in the back but shorter on the sides," he said from Charlottetown. Bob Kirke, executive director of the Canadian Apparel Federation, said there are probably fewer than 25 adaptive clothing companies in Canada, but sees the niche market as one with increasing potential. The challenge, however, is to offer items that meet key requirements for prospective customers while also factoring in the fashion element, he noted. "I think over time, it will be more and more and more compelling to (the) industry to figure out how to bring the selection, the style that people expect," Kirke said from Ottawa. "They don't want to have two choices of colours. They want to have that, plus they want to have the fit or the design that allows them to wear that properly. "It's a real challenge because in the end, right now, it's a small market because people make do. So again, the company that figures it out, that's great — they'll do well. Otherwise, people will be, in a sense, underserved by the clothing that's available. And the one thing I would say is there's many examples of people figuring it out." 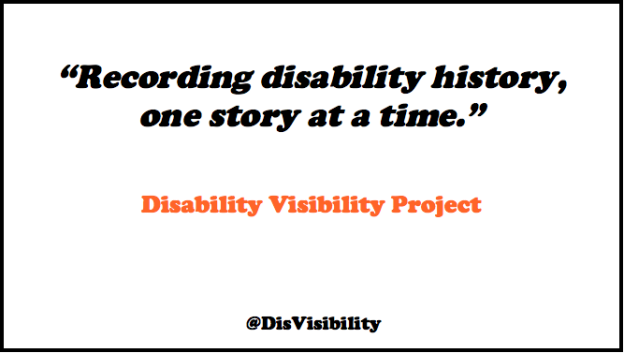 From the National Disability Institute. 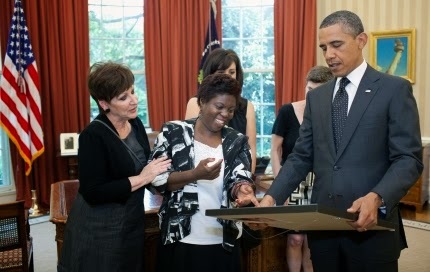 In the picture, President Barack Obama looks at a painting presented to him by artist Lois Curtis, who was an Olmstead plaintiff, center, in the Oval Office 2011. On June 22, one of the most historic legal decisions affecting the civil rights of people with disabilities will celebrate its 15th anniversary. On this date, in 1999, the U.S. Supreme Court rendered the landmark decision in the Olmstead v. L.C. case requiring states to eliminate the segregation of people with disabilities while at the same time, ensure people with disabilities receive services in the most integrated setting appropriate to their needs. The groundbreaking decision not only helped plaintiffs Lois Curtis and Elaine Wilson of Georgia and countless people with disabilities leave institutions and live in the community, but also continues to be applied beyond community living to employment services and supports. In fact, the recent settlement between the U.S. Department of Justice and the state of Rhode Island cited a violation of the Americans with Disabilities Act (ADA) and Olmstead in the segregation of people with disabilities through the state’s reliance on sheltered workshops and facility-based day programs. National Disability Institute (NDI), as the nation’s first non-profit exclusively dedicated to building a better economic future for all people living with disabilities, joins the chorus of like-minded organizations, disability advocates and allies and the entire disability community in celebrating the Olmstead decision and reaffirming the right for individuals with disabilities to live life in the community on their own terms. Join in the conversation online, and get more news and information on Olmstead via NDI’s Facebook: RealEconImpact or on Twitter: @RealEconImpact. The LEAD Center will also feature an upcoming blog post on the Olmstead decision. Finally, the U.S Department of Health and Human Services (HHS), the U.S. Department of Justice (DOJ) and the U.S. Department of Housing and Urban Development will host an event celebrating the 15th anniversary of Olmstead on Friday, June 20 from 1:00 p.m.- 2:30 p.m. (EST). For more information and to watch the entire program online, click here for HHS’ live stream video of the event. The father has been doing this night after night since his son was diagnosed with when he was 11 months old. But Damiano has done more than nightly monitoring to try to protect his son. He's an associate professor of at Boston University, and has shifted the focus of his career to developing a better way to care for people with Type 1 diabetes. In tests with 52 teenagers and adults, the device did a better job controlling blood sugar than the subjects typically did on their own. The were reported Sunday at an American Diabetes Association meeting in San Francisco and also in the New England Journal of Medicine. At the moment, Damiano's system is basically a sophisticated app that runs on an iPhone. The iPhone is connected wirelessly to the kind of that many people with diabetes wear taped to their abdomens. The app analyzes the data from the monitor and sends signals wirelessly to two pumps that are similar to many diabetes patients wear to infuse themselves with insulin. In this case, one pump contains insulin and the other contains glucagon, a different hormone that raises blood sugar when it gets too low. "Because it's more complex, using a pump for each hormone, it may also make it more challenging for the people using it if there is a failure of the system," says , a program director at the National Institute of Diabetes and Digestive and Kidney Diseases. In the worst-case scenario, someone could die from severe hypoglycemia if the device failed. There are plenty of things to take for granted in this life, and the ability to hear is one that most of the population does. But not the team at MotionSavvy. MotionSavvy, which emerged from the Leap Motion accelerator AXLR8R, is building a tablet case that leverages the power of the Leap Motion controller in order to translate American Sign Language into English and vice versa. The entire 6-person team is deaf. The MotionSavvy case embeds the Leap, and the MotionSavvy software leverages the Leap’s 3D motion recognition, which detects when a person is using ASL and converts it to text or voice. 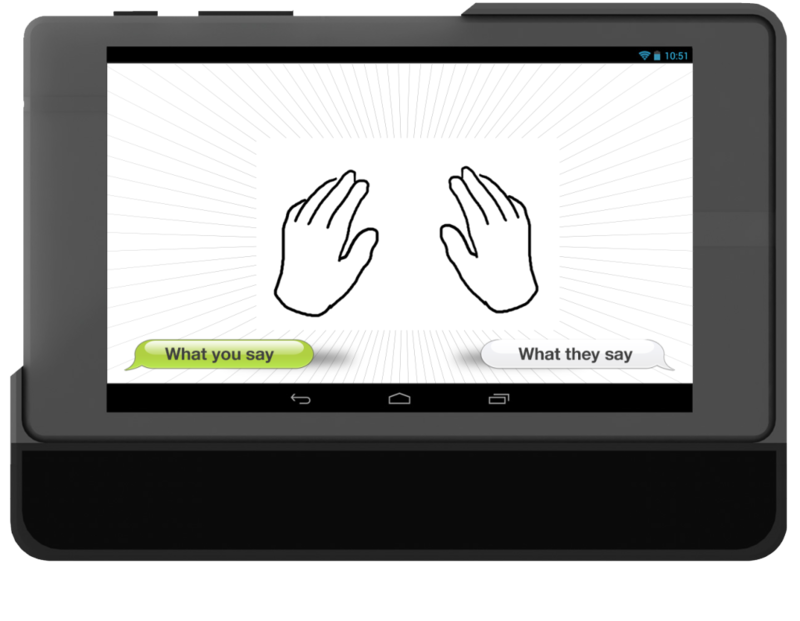 The software also has voice recognition through the tablet’s mic, which allows a hearing person to respond with voice to the person signing. It then converts their voice into text, which the hearing-impaired receiver can understand. Founders Ryan Hait-Campbell, Wade Kellard, Jordan Stemper and Alex Opalka met at the Rochester Institute Of Technology, which includes a deaf-education branch, and built the prototype over a year ago. The original MotionSavvy won third place in the ZVRS competition, which is what convinced Hait-Campbell that the product could eventually have consumer legs. Right now the prototype only understands about 100 words, but Ryan and Alex hope to eventually crowdsource the “massive” number of signs necessary to make this an effective tool. There are many thousands of signs in ASL alone, and various different “accents” or ways it is spoken. Over 800 deaf people have signed up for the beta test, and Hait-Campbell hopes that a consumer-facing product will eventually hit the market in September 2015. He is playing around with a $600 price tag for the case itself, which includes a Windows tablet and a $20 per-month subscription for the software. MotionSavvy eventually wants to build apps on Android, iOS and Windows Phone, and have the hardware work with any mobile phone. “This will allow a deaf individual to feel as if the product is an extension of her/himself,” Hait-Campbell says. Hait-Campbell views this pricing as competitive with that of an average interpreter, at around $60-$100 an hour, but doesn’t think MotionSavvy will put interpreters out of a job. In fact, Hait-Campbell argues that MotionSavvy will create more jobs for ASL translators, as many more deaf people will apply for higher-level jobs because of the increased ability to communicate with colleagues who don’t know ASL. This is especially poignant for international users. The Americans with Disabilities Act mandates a certain level of accessibility for U.S. workplaces and public utilities. Many countries do not have such an act, and thus deaf citizens do not get the services they need. MotionSavvy is in the process of raising a $1.5 million seed round, with SOS Ventures (through the LEAP.AXLR8R) being its only current investor. Despite immense demand, it is still taking beta sign-ups here. There are plenty of ATVs on the market but you won’t have seen anything like this. 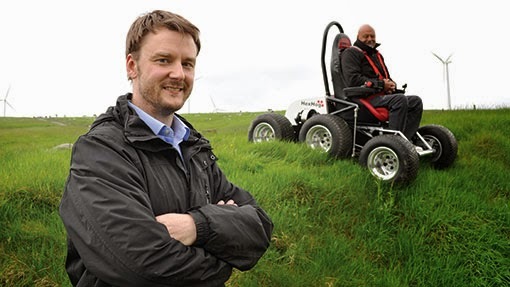 Sion Pierce, a mechanical engineer from Nantglyn, near Denbigh, describes his HexHog as a “quad bike on the outside and wheelchair on the inside”. Powered by lithium-ion rechargeable batteries, the vehicle has joystick control, weighs just 275kg and has a range of 8-12 miles, depending on terrain. That allows it to tackle conditions that able-bodied persons would find arduous. Launched at the Naidex Show at the NEC, HexHog uses two 36v motors to provide independent drive to all six 20x10-10 wheels via low maintenance gearboxes and driveshafts. The machine was conceived as part of Mr Pierce’s degree in mechanical engineering at Harper Adams. “I was inspired having read of a former student’s brother who felt left out when everyone was helping on the farm due to limitations of his wheelchair,” says Mr Pierce. Centipede-like grip is achieved by mounting wheels each side of the chassis from a pivot (situated between the second and third wheel) from which front and rear wheels float on trailing arms. “This patented flexible chassis allows for excellent articulation and ground contact,” explains Mr Pierce. The demonstrator we tested was smaller than the on-line video suggested at roughly 1.8m x 1.2m (5ft 9in x 4ft). It’s fitted with an optional electric retractable seat allowing side-by-side transfer from a wheelchair and a rally-type bucket seat and four-point harness keeps the operator secure. Paddle switches on the armrest alter the seat ride height, allowing you to place your feet comfortably on the aluminium chequerplate floor. A car key sends power to the motors and the HexHog is “driven” with a right hand-mounted joystick. The sensitivity of the joystick control can be adapted to suit individual users. On all surfaces HexHog can easily leave able-bodied persons behind but especially where ground conditions are damp, wet, slippery or undulating under foot. According to wheelchair user Vincent Ross (pictured), whose company will assist in the HexHog’s manufacture, it’s a major step forward. “You feel in control all the time. There’s no sudden sensation of tipping forward or pitching as it moves over the ground. Once you’re used to it you get a strange feeling of security,” he explained. Range is up to 12 miles, with a display on the left-hand armrest showing battery life. A recharge from a normal 13A socket takes a little over two hours. It’s made from off-the-shelf components, so most vehicle electrical engineers would be able to maintain it. It’s also nil rated for VAT, can be driven on the highway on a car licence (it has ATV-style road lights) and can be transported on a lightweight single axle trailer without the need to take a statutory trailer test. A remote control unit for unloading is available. Prices start from £18,000. “On and off road mobility scooters cost around £12,000-20,000 and many are severely limited once outside the urban environment,” explained Mr Pierce, who will manufacture the HexHog with adaptive equipment company Da Vinci Mobility of Liverpool. I'm Lauren Potter. I'm just a 24-year-old girl who is working hard to live my dreams and make my difference in the world. In order to do that, I've had to face challenges. Sometimes even seemingly simple things, like walking and talking, have been a challenge. But I never let that stop me. I have always continued to dream big and to fight hard to pursue those dreams. When I was young, my dream was to be an actress. Sure people told me I'd never be able to do it, but I replied, "Just watch me!" Now they are watching me, but this time on the big screen. I filmed my first movie when I was 16 years old, and I am currently an actress on Fox's hit TV show Glee that just celebrated its 100th episode. As a girl who has accomplished things that many didn't think were possible, I know that people can be wrong when they judge someone else just because they are different. We are all different. And that isn't bad, it's just, well, different! Because of Glee I have been given a chance to pursue another dream of mine -- to make the world a more welcoming place for people who are different -- especially for people like me who have always been told "you can't" instead of "you can." I want to live in a world where everyone can live, go to school and go to work without having to be afraid. Afraid of being judged, afraid of being bullied or cyber-bullied. Afraid of new things. Afraid of failure. Afraid of dreaming. In fact, I want to live in a world where people are actually celebrated for their differences, just as I celebrate mine! Do you want to live in that world? Do you want to join me in "being the change"? I believe we can be the generation that makes it happen! That's why I'm taking a stand for acceptance and inclusion. And I'm hoping that everyone will join me. Special Olympics is an organization that celebrates differences and gives people of all abilities the chance to be a champion and a star. At the Special Olympics World Games Los Angeles 2015, the whole world will have a chance to show that they too stand up for acceptance and inclusion of all people by celebrating the joy, courage and determination of the 7,000 athletes who will participate. I am so proud and honored to be a part of this wonderful mission as a World Games Ambassador. I will continue to cheer on the athletes and stand with them as we tell those who still may say or think we can't do it, "Just watch me!"